Big thank you to Ms. H for providing a comparison of Green Bean to Portapottie and in fact, the differences in the two colors is almost imperceptible. I love getting color comparisons in same fabrics (luon/luon, luxtreme/luxtreme, french terry/french terry). The middle tank is a 2008/2009 green that was the same green as the tartan/plaid print they had in wunder unders and scubas – I believe it was also porta pottie. Savage Green is a bit darker and came out in August 2010. 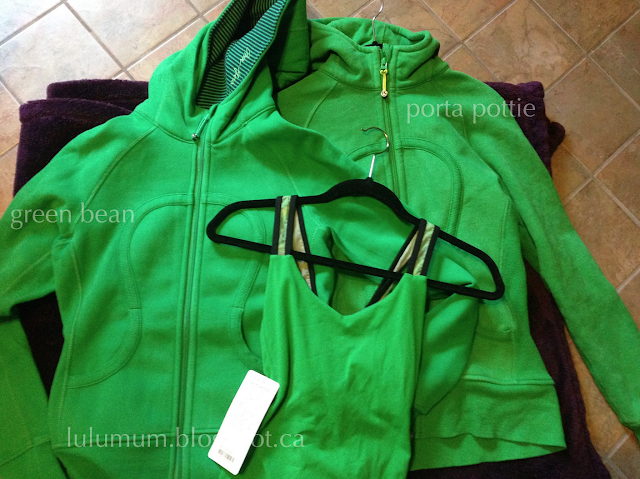 According to Ms. H, she can’t tell the differences between the two colors but she loves the Green Bean Scuba over Porta Pottie because its much softer, and also has the embroidered message in the hood. "New! Green Bean/Inkwell Slalom Stripe Cool Racerback Tank"
"Product Drop Monday: Keep It Cozy Polartec Power Stretch Fleece, Falling Freely Merino Wool Accessories"